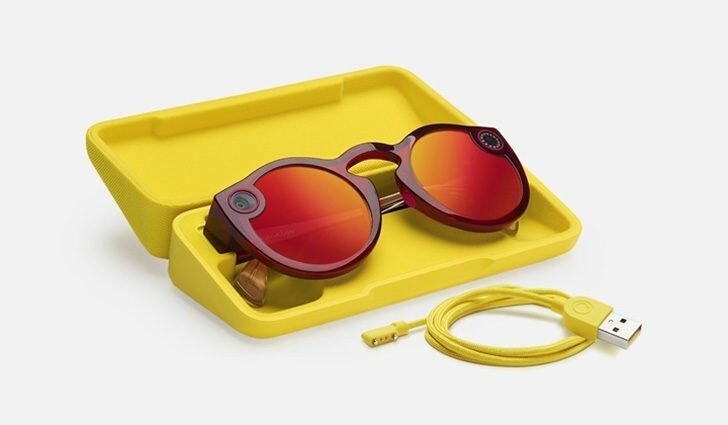 Snapchat has announced the second generation model of its Spectacles, a pair of sunglasses with a built-in camera that records and uploads to your Snapchat account. The second generation model brings a host of changes. The glasses are now smaller, making them more comfortable to wear and carry around. They are also water-resistant, so you can wear them in the pool. The camera hardware has been updated, with HD resolution videos. You can record 10, 20 or 30 second clips. A second microphone now captures audio better. You can now also capture still images, something that you couldn't on the first generation model. The image transfer is now faster and it takes 3-4x less time to transfer files from the Spectacles to your phone over an ad hoc Wi-Fi connection. The battery life is the same despite improved quality and smaller size. You can shoot about 70 videos and transfer them to your phone on a single charge. As before, the glasses charge through their carry case. The case can charge the glasses four times before needing a charge itself. All of this improvement comes at a small increase in price, with the Spectacles now costing $150, $20 more than the first model. They will be available in three colors, Onyx, Ruby, and Sapphire. They go on sale today in the US, Canada, the UK, and France. Netherlands, Norway, Denmark, Belgium, Finland, Poland, Spain, Italy, and Ireland will get them on May 3. The Spectacles will be available through Snap's website. A prescription and polarized version will be offered later.